If you are a paranormal romance, mystery suspense and thriller fiction lover, than this short, enthrilling and suspenseful mystery short read is just your cup of tea. The story is so engrossing that you will fly through the pages in no time at all. If you are quiet short on reading time - this Cursed City, Cursed Blood Line Series was written with you in mind. This is the tale of an average modern city that slowly descends into madness when monsters start popping up in different parts of the city. The monsters are drawn to the city through some mysterious means, and the invasion is seen through the eyes of the various main characters of the story. They are connected in some mysterious way, and may even hold the key to stopping the bursts of monster incidents in the city. But what happens when some of them actually fall in love with the creatures that are ravaging the city? What will be the implications of these? Read the stories and find out! Book One: Gargoyle is the tale of Jack Scryer, a freelance writer who finds himself at the centre of a gargoyle attack on his home city. When gargoyles start to mysteriously pop out of nowhere all over the city, it sparks a lot of speculation and the gargoyles become an overnight sensation. However, when they start kidnapping children, Jack finds himself compelled to investigate the gargoyles and hopefully find a way to stop them. 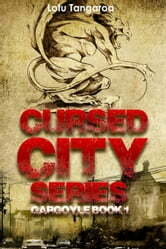 The city is caught in the grip of terror as the gargoyles continue to kidnap its young citizens. Things start to really become intense when Jack tries to directly stop one of them from kidnapping a child. This will lead to a series of events that will change Jack's life forever. Since we don't want to disappoint your reading experience by keeping you in suspense after reading Book One. You will be happy to know that Book Two: Zombies is yours for free as bonus ( inside the book) for supporting our career as indie authours.